10 years of research, 7 patents pending: TEINT MIRACLE opens a new era for cosmetics. Its miracle? Aura-Inside™ Technology, a NATURAL LIGHT CREATORcombining a new generation of pigments inspired by Optical research applied to Biology, with a unique liquid light essence. A true Lancôme exclusive which works on each component of natural light, both re-emitted and reflected, when traditional foundations only play on surface radiance. Infused with skincare active ingredients, its texture intensely hydrates skin for 18 hours, leaving it instantly luscious and plumped. Day after day, this hydration reinforces TEINT MIRACLE’s results: skin is smoothed, more able to reflect light and gains transparency to better reveal its inner light. Even after make-up removal. Enriched with soothing rose extract, TEINT MIRACLE also minimises the appearance of uneven skin tone, for a unified and radiant complexion. SPF 16 for daily protection against ultra-violet rays. Dermatologically tested formula: suitable for all skin types, even sensitive. *Upon receiving the above mentioned makeover, you will also get a TEINT MIRACLE sample according to your skin tone shade. For more info, contact 1800-880-112. TRY, SNAP, TAG! Stand a chance to win a bottle of TEINT MIRACLE worth RM120! TRY the mini makeover and redeem your TEINT MIRACLE sample! SNAP a before-and-after makeover photo! Post it on our FB wall or on your wall andTAG us! And…guess what? We are very excited and honoured to be able to invite Jazz & R&B singer Atilia (who is a fan of Lancôme products herself!) to be a Guest Judge and pick the 10 best before-and-after makeover pictures. *Deadline to submit your photo and tag us: Monday, 25th October 2010. List of winners will be announced on first week of November 2010. - One sample per customer. While stocks last. - Sample only given upon receiving the above mentioned mini makeover. - Sampling ends 31st October 2010. - Lancôme Malaysia reserves the right to change, amend, delete or add to the terms & conditions without prior notice at any time. - One entry per participant or Facebook fan. 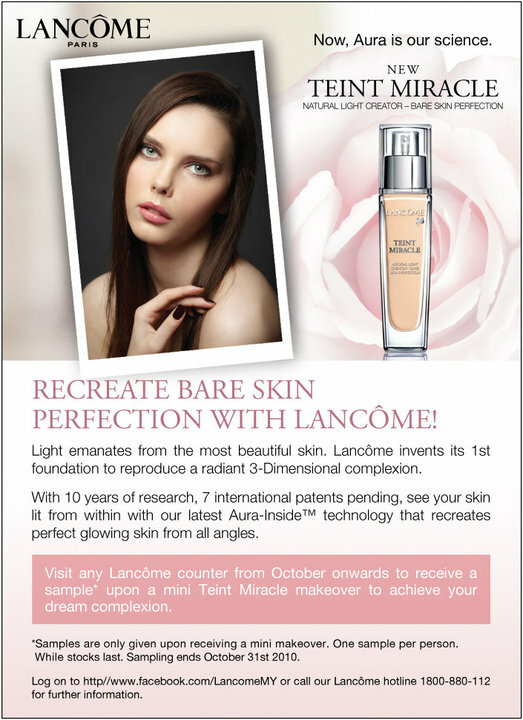 Contest is open to Lancôme Malaysia Facebook fans residing in Malaysia only. - Lancôme Malaysia reserves the right to change, amend, delete or add to the contest terms & conditions without prior notice at any time. - In the event of unforeseen circumstances beyond its reasonable control, Lancôme Malaysia reserves the right to cancel, modify, suspend or delay the contest period. - Lancôme Malaysia reserves the right to reject any entry at its sole and absolute discretion without having to assign any reasons whatsoever. - Prizes are non-transferable and non-exchangeable for cash or in-kind.